Apple watch OS 2 : All you need to know, explained ! We all live in a digital world, which is mostly dominated by Gigantic companies like Apple, Google & Microsoft. Take Smartphones for example, there's not even a minute, where we can blink a moment without them. We are constantly hunting for updates may that be suiting your niche, or social updates " WhatsApp ", Just constantly tinkering around with your smartphone to stay ahead in your league. So back in 2011, a kickstarter project named " Pebble " came with an idea of Smartwatch, with a concept of dismissing notifications on your watch without the need of pulling smartphones out of your pockets, they quickly got grabbed a lot of attention. The Pebble Time(company's latest watch) has raised more than $20.3m on Kickstarter. Since then after Pebble's immense growth, back in 2014 Google introduced it's own Android Wear platform, as over the course company's like Sony & Samsung were creating Watches on top of their own proprietary UI, and it was hard for them to cope up. Well since the intro, Android Wear isn't performing that Well, Yes over the course a lot of improvements have occurred, but people still can't find a reason to buy this accessory that's attached to your wrist, connected to your smartphone (24/7) and constantly buzzes you for notifications. That being said whenever a new gadget comes up, there's always this buzz : So what's with Apple ? 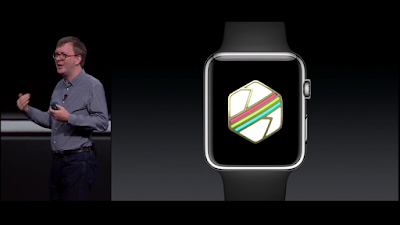 Apple responded Android Wear with their own WatchOS bringing in Apple watch last year! Yes, the watch that costs about a phone's price (base model), don't worry fanboys not going to speak about that 10000$ stuff. Let's keep that price tag thing away, let's speak about flexibility it provides as an extension of your iPhone. 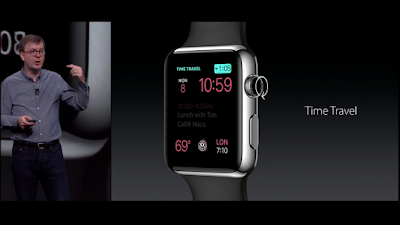 Apple watch was launched with Watch OS. Apple truly was first to bring an actual launcher inbuilt despite speaking of the competition with features like Siri, Measuring stand activity, maybe annoying but a Feature that tells you to walk a bit after a certain amount of time, Calculating calories for indoor cycling & rowing workouts, Distance and pace during outdoor walk & run workouts, Third party apps support! These in particular were introduced in watch OS 1.0.1 But earlier this week, Watch OS2 made its debut at Apple's WWDC 2015. Is the update incremental ? Yes, but is it necessary? We will find that out.. Improvements to communications , health & fitness. Apple was the only one to allow their customers to tweak their watch faces, than any competitor's. Well now, You can put any image from your library as your wallpaper or display random images from a selected album, those images will shuffle with that wrist movement you do to simply check out the time, its pretty convenient! That's not it, there even are Time lapse's available from five Different places like London, Shanghai, Hong Kong, New York & Mac lake(Sierra). Apple has created time lapses of particular locations from those above & You can put them as your watch faces, and the crazy part is, if its night, the watch face will show you night moment of that particular time lapse. Now developers can create their own Complications in Watch faces, or simply third party stuff can now be added on watch faces. Also, Now if you want to see your upcoming reminders, just rotate the digital crown while you're on a watch face, an see your events at a glance past or future, Apple calls this "Time Travel". 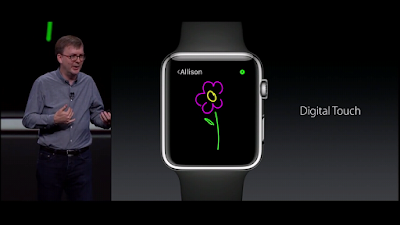 When you're done exploring it, simply press the digital crown to return back to the watch face. Ohh by the way, the night stand feature from Moto 360 makes it's way to the Apple watch. Simply snap it on to the charger pad & it'll instantly turn into a gorgeous watch face, you can even set alarms! Remember that digital touch feature?, in which previously you were allowed to sent messages via those taps/heartbeats, which was limited to 12 friends ? Well now, you can add more friends and sort them into groups like work, family..etc. Also more palette of colours have been added here in digital touch. Now you can even reply to the incoming mails. Really Apple, do you think anyone's going to use it? Anyway, Facetime Audio makes it's way here now. You can now use All your Fitness tracking apps while doing your workouts, and as these Apps are native to Apple Watch, you no longer need to be connected to your iPhone! & no matter which App you use, all your work stats will show up in All Day Activity. 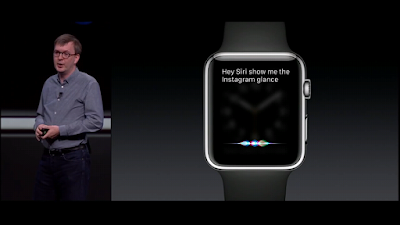 Siri now can assist you here with setting up goals and timers. When you complete you Goals you will be awarded with some pretty cool 3D badges, kinda like from Nintendo games! And as you know the drill, you can share it online. Google work on that ! Apple watch is simply awesome at Apple pay stuff, even unlocking your doors with a simple hand wave gesture near the Apple pay reader is hands down the best in the industry, period. 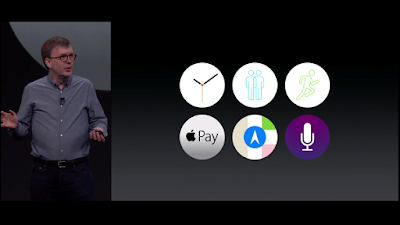 Just like in iOS 9, all your reward & store cards will now be available through Watch OS 2. The new Wallet(passbook) app also makes its way here, with the updated Rewards and Store cards. Nothing, but simply a long awaited feature makes, its debut here same as we saw in iOS 9 & that's Transit on Apple maps! 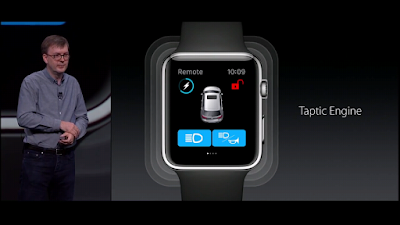 You will also get turn by turn directions, now on your Apple watch. Siri can now be triggered on by saying, " Hey Siri.. ". Siri now can help you with transit information, navigating to different places and glances, which now supports third party apps with Siri's integration. Those who are not familiar with glances, those are simply cards like you see in Google now, that appear with a swipe up from the bottom in Apple watch! She can also control the lights, temperature, or any connected service with Apple's homekit function in correspondence with the devices at your home, due to Apple's homekit APIs. Simply Say, " Hey Siri, it's evening tone down the lights ". That's not it, Now that Apple watch supports native Apps it means you no longer require your phone to be connected and the Apps use same logic both on iPhone and Apple watch. WiFi can also be used independently, but there's a catch if it's a protected WiFi network, you need to enter the WiFi password from your phone. Now you can even record audio via watch's in-built microphone, playback music via watch's speaker or via Bluetooth headsets and even play short form videos?! Wait a second, what ??! Video ? ohh ,ok. i can simply pull out my phone to watch a video, Apple. 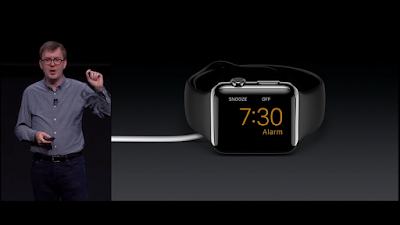 Homekit, healthkit & Taptic engine now play a vital role now, extending the functionality of the watch. Download your beta here : Watch OS 2, it will be available as public release later this fall. Final verdict : Yes, its going to be great to have Native apps support for Apple watch, but that in turn is now going to eat up your space now alot, but many will live with that. Battery drain will mostly not be an issue as Apple has had amazing standby times for iOS devices, not quite sure about the Apple Watch. I highly doubt those videos feature, Really are you really going to show videos to your friends on your WATCH ? Well, maybe during fanboy battles, yeah it'll come in handy! So Does is it mean Watch OS 2 is best over Android Wear 5.1.1 ? Nope, there's are enhancements & minor flaws on either sides! Flaws : Both are restricted to their own ecosystem ! Also see : Top iOS 9 features explained!